Bose Solo TV Sound System - Black. Condition is New. Shipped with USPS Priority Mail. Excellent physical condition. One small scratch near front logo. See photo. Contains: Speaker, power cable, remote and manuals. Bose Solo 5 TV Sound System In Excellent Condition Bose Sound !!! 4.5 out of 5 stars - Bose Solo 5 TV Sound System In Excellent Condition Bose Sound !!! 2 product ratings2 product ratings - Bose Solo 5 TV Sound System In Excellent Condition Bose Sound !!! BigTechLiquidation Cosmetic condition: ---Good Used Condition with some Surface Scratches and other Signs of Wear Functional condition: ---Tested. Fully Functional. Included: ---Speaker w/ generic power cord Not Included: ---Remote ---AUX cable ---Box ---Manual ---or Any Other Accessories. Our Policies: Payment: Tax Policy: ⦁ Buyers from Ohio state will be charged 8 % sales tax. Shipping and delivery details: ⦁ Make sure that shipping address is correct and matches address provided by Pay Pal. ⦁ We DO NOT ship to APO, FPO or PO BOX address or military bases. ⦁ If your address is not correct or is not confirmed by Pay Pal, we are not responsible for safe delivery. ⦁ We are not able to change or modify the address before or after item is shipped. Trending at $97.50eBay determines this price through a machine learned model of the product's sale prices within the last 90 days. Bose Solo TV Sound System Speaker with Remote model 410376. Condition is Used. Shipped with USPS Priority Mail. Main item with generic power cord. or any other accessories or cords. Trending at $180.95eBay determines this price through a machine learned model of the product's sale prices within the last 90 days. Bose Solo 5 TV Sound System✔️Brand new NO BOX✔️Fast Shipping✔️. Condition is Manufacturer refurbished. Shipped with USPS Priority Mail. This is a used, but in very good condition, Bose TV Sound System. Connect this to your TV audio output and enjoy enhanced sound from your TV without the need for a large audio system. I personally tested this unit and it sounds great on music and TV. I had it hooked up via RCAs and optical audio in to my TV. I also personally upgraded the firmware which adds the option to adjust the BASS level from normal to LOW. Power cord is not original but it worked with Speaker. TV Remote as bonus no batteries included. 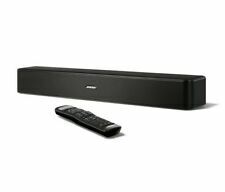 Form Factor: Soundbar Model. NEW BOSE SOLO 5 TV SOUND SYSTEM - Bluetooth Free Shipping Factory Sealed. Condition is New. Shipped with FedEx Ground or FedEx Home Delivery. 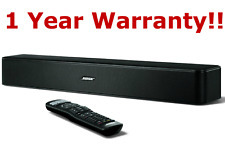 This is a Bose Solo TV sound systems Model 410376. Tested and in working condition. This is for the speaker unit only. Does not include power cord, or remote. We would love to make a deal! Bose Solo 15 TV Sound System. it. what you see in the picture exactly what your get. scratches and dents on the body. Wide, even sound throughout the room from Bose speaker array technology. Good Condition - Bose TV Sound System is previously owned and works great - no issues, minor wear from light use. Power Cable. 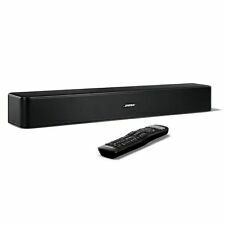 Bose Solo 15 Series II TV Sound System With Universal Remote. Great Condition! Bose Solo 15 Series II TV Sound System - Black. This is in excellent used condition. Comes from an adult only smoke free home. Comes with original cables, universal remote, manuals and original packaging. Recently upgraded to a larger surround sound system. The sound quality for this is really nice. Had tried some smaller sound bars before, and this has much fuller sound. Shipping is a fixed $40 NO INTERNATIONAL SHIPPING! 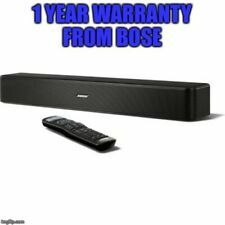 4.5 out of 5 stars - Bose Solo 15 Series II TV Sound System With Universal Remote. Great Condition! 394 product ratings394 product ratings - Bose Solo 15 Series II TV Sound System With Universal Remote. Great Condition! Bose (410376) Solo TV Sound System - Black. Condition is Used. Shipped with USPS Priority Mail. Item does not include remote. Used good condition. Powers on. Free Local Pick-Up. This system is used but in good condition. I am more than happy to give you a quote. (OKLAHOMA 8.517%). This is a Used Item frequently used. I did notice a bit of scuffing on the remote due to poor storage conditions. Bose Solo TV Sound System With REMOTE tested. In working condition.